ST. LOUIS -- Blues winger Paul Kariya clarified his situation a little at the morning skate Monday after performing as a defenseman in drills. That was at coach Andy Murray suggestion that it would help him skate "backward and forward and open up my hips." Kariya could be activated to play the point on the power play as well. 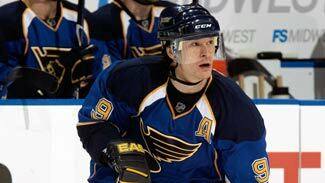 Kariya had left hip surgery in January and a right hip operation by Dr. Marc Phillippon in Vail, Colo., in February. The word Monday was that Kariya has gotten clearance to practice with the Blues from Phillippon, but must get clearance to play from the doctor. He said he expects to talk to Phillippon again sometime after Tuesday's morning skate. "When I saw those two 5-on-3s (in Game 3) I really wanted to be out there," Kariya said of the possibility that he could be helpful from the point on the power play." ST. LOUIS – Blues captain Keith Tkachuk sent a clarion call to his teammates to start doing the dirty work against the Vancouver Canucks or the Stanley Cup Playoffs will be over before they start. "Part of it is not (having) a willingness to be strong and to get pucks to the net and battle for it," Tkachuk said. "You don't win with perimeter players and that's the problem on our team right now. It's just work ethic, getting the puck and being strong on it, not losing the second- and third-effort battles. "We had the momentum, up 1-0 and we played a solid 20 minutes. You don't win games when you play a good 20 and a bad 40. It's impossible." The new math -- When does being down 1-0 feel like you're up 3-zip? It's a simple hockey equation that Vancouver Canucks center Ryan Johnson was talking about Monday following a 3-2 victory against the St. Louis Blues that gave the Canucks a commanding 3-0 lead in their Western Conference Quarterfinal series. "We came in the room after the first period last night and you would have thought we were up 3-0," Johnson said. "Guys were excited, especially about that 5-on-3 chance they had for about a minute and a half. What did they get three shots? Three bad-angled chances." It was 1:26 actually, but the point was any of four power-play opportunities the Blues had in the first period could have extended David Backes' goal three minutes into the game into a 2-0 or even 3-0 lead. "We know their weapons and know what they're trying to do," said Johnson, who was on the ice for 5:38 of the Blues' 9:31 of power-play time. "We want to force them to make a perfect play. We don't want an easy through-the-crease tap-in. We want to make them have to make a perfect shot and it's tough when we stay tight like we have. You could see as it went on, they started to press a little bit more. It was the turning point of the game." Special numbers -- Vancouver was 3-for-4 on the power play in Game 3, getting second-period goals from Mattias Ohlund and Daniel Sedin 2:21 apart for a 2-1 lead and breaking a 2-2 tie on another man advantage tally early in the third period by Steve Bernier. Plus, they killed off all six of the Blues' man-advantage chances. The feat becomes a little more special when you consider that the Blues were third in penalty killing and eighth on the power play in the regular season, a big reason for their appearance in the playoffs for the first time since 2004. For the Canucks, it was the seventh time they had scored three or more PPGs in a playoff game, but only the second time they did so on the road. The previous instance was a 3-2 win in Minnesota on April 29, 2003. "Those two 5-on-3 kills were our success tonight in a nutshell," defenseman Willie Mitchell said. "We found a way to scratch and claw and get it done. We've got a lot of guys who care about our team. We're doing what it takes to win ... together." Another mind-boggler -- No Mats Sundin? No problem. The big free-agent addition was out with a groin strain he apparently tweaked in the first period of Game 2 in Vancouver last Friday. Without Sundin, Jannik Hansen moved up to line that Ryan Kesler centered with Pavol Demitra. Later in the game, Rick Rypien got a chance with Kesler and Demitra. For the game, Kesler had two shots, two hits, one blocked shot and was 6 of 13 on faceoffs. Demitra had two shots and one hit. Sundin did not skate with the Canucks on Monday. "I'm going to try it tomorrow morning at the skate and see how it feels," Sundin said. "Obviously, no one wants to have injuries, particularly at playoff time." Payback – Alain Vigneault said St. Louis' hard-hitting and sometimes chippy play in the first two games continued in Game 3. But Vancouver got a payback with the three power-play goals. "Our guys have been taking a lot of cheap shots during this series," he said. "To respond with three goals on the power play is pretty satisfying." "I'm pretty sure he's going to make some changes with his lines," Vigneault said. He hinted that Keith Tkachuk might get a bigger role offensively and wouldn't count Paul Kariya out of the lineup. Not dead yet -- David Backes came up with an interesting analogy to the Blues fate of being down 0-3 in the series, saying, "It's like a dog backed into a corner. There's lot of fight left. I know one thing: We're not ready to shake their hands yet or get the golf clubs out for the summer."